Much as I'm a fan of DIY fixes, tinkering with Windows' networking settings (especially XP's) is so confusing, frustrating, and frequently fruitless, I'm going to suggest a different (and much simpler) solution. 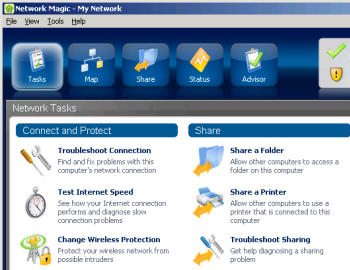 Yep, you guessed it: Cisco's Network Magic Essentials. Install this fantastic utility on both your PCs and in no time you'll be swapping files, sharing printers, and so on. Trust me: it's the path of least resistance. The software costs $29.99, but there's a free 7-day trial. If your main goal is simply to migrate files and data from an old machine to a new one, that should be plenty of time.